2015 Triangle Pen Show | Inkdependence! It was a busy weekend! I was at the Triangle Pen Show for all three days, and I took almost zero pictures on the first couple of days. I kept carrying around a camera in my pocket, but I was too busy talking to folks and finding cool pens to look at. Almost all of the following pictures were taken by my wife on the last day of the show. I've reviewed two of these pens on the blog. Check out the reviews for the Traveller and the Optimist when you have a minute.This table was the first one you saw when you walked in, and it was good to see them there this year. They didn't make it to Raleigh last year, and they were missed. If you're not familiar with the Diplomat brand, they're a German company that has been around for a long time. Their pens are usually understated with nice details, but they're branching out into more colorful fare according to the reps. These pens are really fresh looking, and they're called the "Esteem." It's a larger version of the Traveller that I reviewed. I've shown this pen before, but it's the first time I've seen the brown one in a fountain pen before. This one actually has the gold nib, and it's a cool two-tone nib. The Diplomat flower is on the nib, and the petals of the flower are gold in the silvery nib. It's a good look. Also, there will be more colors for this pen in the near future. I think the brown is awesome, but I'm interested to see what else they do with it. These two dudes are always awesome to see at the shows. We found out lots of things about chocolate from talking to him, and those chocolates are darn good. It's amazing to me that there aren't more food vendors at pen shows, but he's got that market cornered. If you get a chance, eat his chocolate. Also, talk to him. He's very cool. Want to pair chocolate and a pen? You can do that. There's Audrey trying out some of that chocolate. In the background is Ryan. He's got some of the best looking art-pens around. Check out his site, and watch the video that shows how he hand-paints the limited editions. The pens below are some of the scrimshaw work that he does on antlers. No animals harmed, those antlers fall off all on their own. It's really impressive work. He's also got a lot of other designs, and the woodwork is my favorite. We didn't catch any pictures of them this time, but there are plenty of them in my other show reports. For the picture below I just said "Hey! Scott!" He's legendary for his taciturn-face, but don't let that fool you. He's rad and always willing to talk about pens or whatever. Franklin-Christoph is local, so I hope to hang out with Scott, Jim, and Dan in the future. 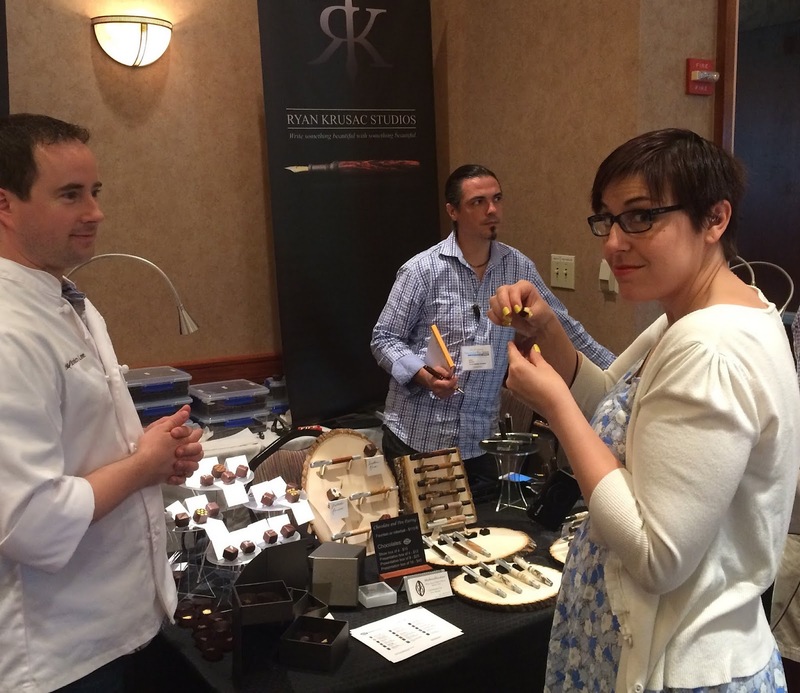 Audrey got the first pen of the show (on Friday) from Franklin-Christoph. It's a one-off model 20, and you'll be seeing it in the near future. Check out the 20 on their site. It's pretty rad. Below is Jim. He's an old hand at the pen business, and that dude has stories. He's also made barrels for some Sheaffer PFMs that are much more interesting than the originals while keeping the same shape. Check out those wooden nibs. Cool, right? These are the 20s that were left on Sunday. More colors than F-C usually sports, and that's fine with me. The 20 is a slip cap, but it's very secure when capped or posted. I don't know how they did it, but it's good engineering. You'll also find some nice leather goods and some excellent paper at F-C. The paper is all sugarcane, and that's some of the best fountain pen paper around. I recommend it. Looking for limited editions, rare pens, or really good deals? Check out Jimmy's table. Almost nothing on those tables will have a price tag but he can look at the pen and tell you the price along with some history if you ask for it. Mostly modern pens, but he's got some of the coolest stuff at the show. How about that Pelikan statue, huh? If I get a Pelikan I'm going to have to find the statue to hold it. These are my favorite pen-people. Brian and Lisa are always my first and last stop at any show. They've got the best selection of modern pens at the show, and they generally have a solid selection of ink and vintage pens, too. They seemed a little light on both of this this time around, but that's okay as there are plenty of vintage vendors at Raleigh. The really fancy notebooks on the bottom of the right-hand rack are Paperblanks notebooks, and they're really sweet. Anderson Pens is giving one away on their blog, and all it'll cost you is a stamp. This is Brian answering questions in front of half of the modern pens. Yeah, half. 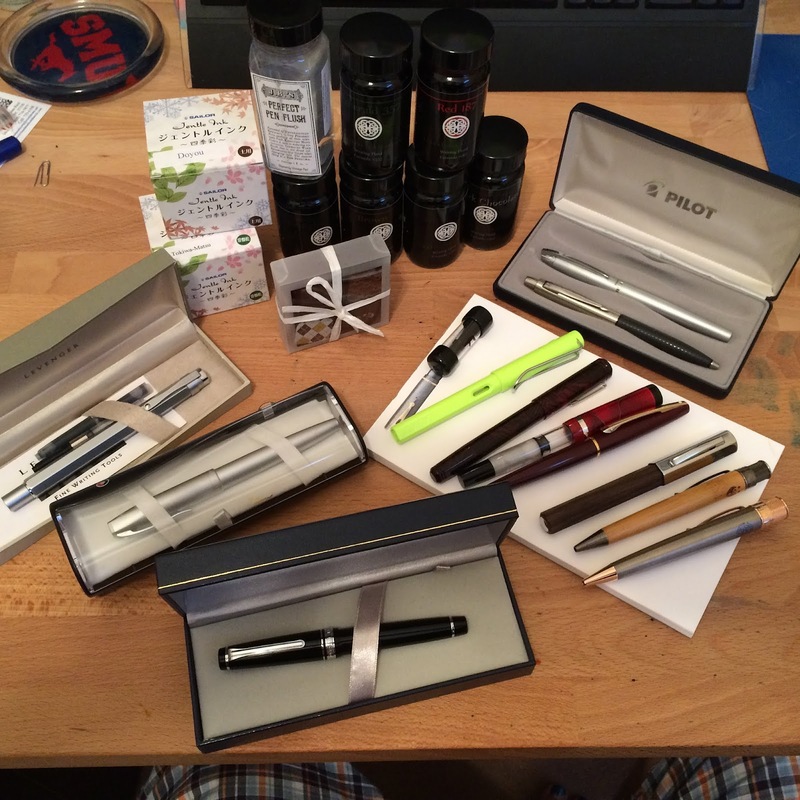 Montblanc, Faber-Castell, Lamy, Stipula, Pilots, and lots of others in that shot. This is the new exclusive Delta Unica from Anderson Pens. I reviewed the red one a while ago, and it's an excellent pen. This time it's a dark green pen with chrome hardware, and it's a sharp lookin' pen. I didn't end up getting one, but I was sorely tempted. It's a cool pen with a really good nib. Also, look at those nails. Nice, right? This rack of pens is where I got into trouble. That Sailor Pro Gear that's in its own box on the left-hand side ended up going home with me. It's my first Sailor, and I really like it. The 21k nib is stiff, but I really like it so far. I almost took that orange Pro Gear, but I decided that I needed a black pen this time. And here are Brian and Lisa during a lull in the action. I got to have dinner with them (and Jim) on Saturday evening, and it was a blast. I don't show up in a lot of pictures, but here I am with Brian. The video below is what happened when Brian took out the Sailor tester pens. Our local Triangle nib-smith, at work. I've got a pen to review from Bexley. Here you'll see Jonas from Massdrop with Howard Levy, Bexley's owner. I've admired Bexley pens at these shows for a few years, but I've never used one before now. I've got a feeling that these made-in-Ohio pens are going to be around for a long time to come. Alan is an interesting cat who owns the closest pen shop to us. Located in Chapel Hill, his shop has a crazy-good selection of single pens, pencils, and papers along with fountain pens and inks. I always make it a point to stop and talk to Lee for a while (the time flies...it could be hours for all I know) when I see him at this show. I've really only gotten Esterbrooks from Lee, and if you ask a question you'll get a thorough answer along with a reference to his binder of promotional and historical papers. Gerry is, by all accounts, the best guy to fix up a Sheaffer Vac. He worked on one of the desk pens from my Grandma's estate last year, and I've just given him the other pen from that set to get in working order. He does a great job, and he's always willing to talk Vac tech and models. His pens may seem to be on the expensive side, but you can be certain they'll be in perfect working condition if he says they are. Need a pen repaired at a show? Go see Ron Zorn. He'll get you fixed up. He's brisk, but don't mistake that for unfriendlyness. If you catch him in a slow time at the show (not that he has many) he's great to chat with about whatever. I like to just stand around and watch him work. Real master-level stuff, there. So, what did I end up with? A lot. 6 new inks from Franklin-Christoph (press samples for review). I've already inked up all of these in pens, and they're lookin' good. A bottle of JB's Perfect Pen Flush. This stuff is like magic for cleaning out pens with stubborn dried-up ink. I know I could make my own but I'm not going to when I can just get JB's. 2 bottles of new Sailor inks. I reviewed this set, and these were a couple of the standouts for me. Doyou and Tokiwa-Matsu had to come home with me. A box of chocolates from Brandon Lee. These are all gone now. We just ate them. Awesome. The Dark Chocolate Stout one was my favorite. So good. The Pilot box has a Pilot Knight in it. It's a step up from the Metro, and I got it for a really good price. There's also a Parker in there that I think is a Jotter, but it's larger than the others that I've seen and it has a rubbery grip section. Real nice. A new Lamy Safari for Audrey in the Limited Edition bright yellow-green color. The Bexley Phonix in a fine nib. A Sheaffer Taranis with a medium nib. 2 Retro 51 Tornado Big Shots in bamboo and titanium. A Sailor Pro Gear with a 21k HM nib. My first Sailor. So good. Some of these are samples for review, but it's a fairly awesome haul. I also have to say that I met some blog readers at the show, so Hi! to all of them. It's great to know that there are readers out there. Feel free to leave a comment on this post to let me know what you found at the show that you couldn't live without.